As shown in our topic book, the three times tables that children should be securing this year are the 6, 7 and 9 times tables. If you feel you are confident with your tables, follow this handy LINK to test out your skills! It's Spring time in Year 4! Welcome back from your winter break year 4, you can find a copy of our Spring Curriculum booklet HERE. We are learning to spell words that end in an 'iv' sound but are spelt 'ive', the 'e' is silent. As part of your child's homework, each word should be practised 5 times using LOOK, SAY, COVER, WRITE,CHECK. 5 of these words should then be written neatly in sentences. See below for our latest class news, activities and triumphs! Well done Year 4, we are now two thirds of the way through our school year! Don't forget, this holiday we are running another Sumdog maths challenge. Like last time, the top 5 scores by the 23/4/2019 will receive 50 house points each! All the skills that have been set for you relate back to this term's learning, so it's definitely worth having a go! As always, you have Maths and Literacy homework in your homework books too. There will be a homework club on the Tuesday we return to school if you need help and advice, but your homework is due that day, Tuesday 23rd of April! Remember, keep reading over the holidays! You should have at least 10 entries in your reading diary by the 23rd of April. If you finish your book, anything books you have at home are fine to read too! Today in Year 4, we whipped out are atlases and were working on locating features on Antarctica on a map and then plotting them onto our blank Antarctica templates. Some of us even had a go at drawing our own Antarctica outline, being mindful to observe changes in land shape and orientation. We plotted on features such as Mount Erebus, the Ross Ice shelf, the Weddel Sea (home to the Weddel seal) and many others. Great geography skills year 4! 1.4.19 Preparing for our final Independent Write this term! This half term, Year 4 were focusing on writing recounts. As final preparation for writing our own we took a look at an example and practised identifying and evidencing the criteria for a recount. The criteria included things such as past tense, time conjunctions, details etc. Year 4 worked in pairs and used colour pencils to identify and record the criteria they found. Well done guys! 29.3.19 - Mothers, don't look yet! Today in Art, Year 4 were yet again getting extremely busy! As this Sunday is Mother's Day, Year 4 were busily preparing some beautiful flower pictures to give this weekend. Using their observation skills and careful painting work they've made some truly wonderful cards. We'll leave the messages inside as a special treat for those wonderful Mums at home! Well done Year 4, super thoughtful! We've been learning to put tenths and hundredths in order on number lines and recognise when they represent equivalents. We used Base 10 to support our identification of decimals and fractions (concrete), we've used hundred squares to find pictorial representations of fractions and decimals and we used decimal tickets to practise identifying order (our abstract knowledge). 22.3.19 - Some Frozen Fun! Today, Friday the 22nd of March, Year 4 and Mrs Hill were creating igloos as part of their Art and Design lesson linking to our humanities topic of Polar Explorers. 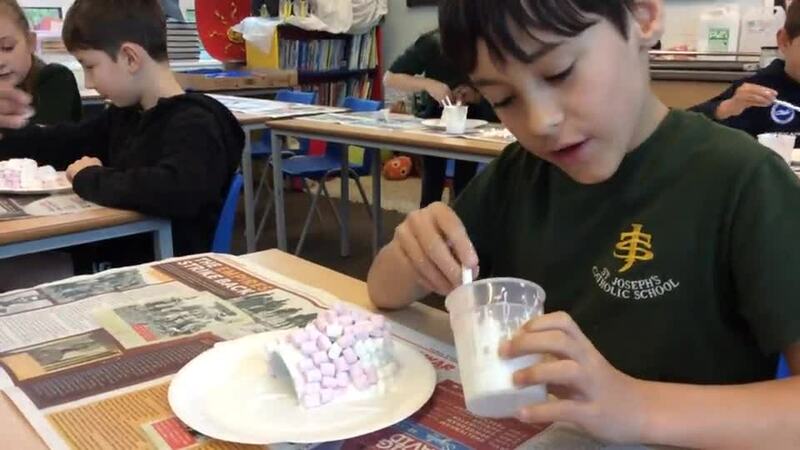 The children used marshmallows, glue, an empty yogurt pot and some card to create their amazing structures. Once the structures have dried, we should be able to remove the yogurt pots and have standing Igloo structures. It was great fun and children worked hard to create not only inviting patterns but good structural balance as well! Great job Year 4 and Mrs Hill! As part of our science topic of the Human Digestive system, Year 4 have been learning all about our teeth. Last week, after having learned about our different types of teeth, Year 4 decided they wanted to know how our teeth are affected by sugar. We used an eggs (to be our teeth), a sugary drink, toothpaste, a clean glass jar, a teaspoon and a measuring jug. Half of the eggs was coated in toothpaste using the teaspoon, the other half was left clean. The egg was placed inside a jar along with 200 ml of sugary drink. We secured the lid and waited a week, making sure to check them (we each had an experiment) every day. Then, on the 22nd of March, we opened our jars and took a look. There was a lot of damage; we observed erosion, staining and cracks in the eggs surface that were plainly visible. The part of the egg that had been covered in toothpaste was still stained, but suffered much less damage. But even most of our toothpaste had been washed off! Year 4 came to the conclusion that even with careful dental care too much sugar could cause damage to our teeth, they also established that regular brushing would reduce the amount of dirt on your teeth and prevent extensive decay. 21.3.19 Getting Down With Our Decimals! This week, Year 4 started their new Maths topic of decimals (following on from fractions). We've been establishing how decimals, like fractions, are used to represent whole and less than whole values. We've seen them in money, measurement and fractions already, so we know they're useful! We used place value counters to practise counting in tenths and identifying what happens when you reach ten tenths, we now know that it's the number that moves NOT THE DECIMAL POINT! We've had great fun exploring this and are looking forward to learning more in the final weeks of the Spring Term! Don't forget, the Big Bunny Bonanza Sumdog challenge starts on the 4th of April! 14.3.19 Our Inquiring Minds Were At Work! As part of our science topic on the Digestive system, we have been learning about teeth. We know that are teeth are made up of different layers and that we use toothpaste and regular brushing to keep them clean. We know that sugary and acidic foods can be dangerous for our teeth but we wanted to know how toothpaste helps to protect our teeth from decay (which means rotting). So, to examine how teeth are affected by sugary and acidic food we decided to conduct an experiment. We each brought in a clean jar from home, then we took a fresh egg and coated half of it in toothpaste. Having coated the eggs, we placed them in a jar with 200ml of Cola. We are in the second phase our our experiment now where we will observe changes to our egg over the next week. In our books, we made predictions of the outcome, wrote down the steps of our investigation and drew diagrams to record the experiment. We'll let you know what happens next! 30.1.2019 - Famous Author Comes To Visit! The excellent and lively author Steven Butler came to visit us today. He came to share his love of writing, his passion for books and some brilliant jokes.We were lucky enough to have a reading of one of his latest books in the Dog Diaries series, a series that is in partnership with the well-known writer James Patterson, which had us all in stitches. Steven also gave us a masterclass in drawing the lead character of the Dog Diaries series, Junior. We got to ask questions about becoming writers and how we can also one day be authors too! Thank you so much to Steven for visiting and a special thank you to Mrs Muschamp for organising the visit for us! What an amazing afternoon! Week commencing 21.1.19 It's all about pushing yourself! This week, Year 4 have been stepping up their game by making use of homework clubs, booster sessions and lunchtime learning clubs. It's been great to see our young people feeling motivated to go further in their learning, attending their booster sessions and making use of every moment of learning time. Well done Year 4, keep up the hard work! 25.1.19 - Getting stuck in! This week in Art with Mrs Hill, Year 4 began their project on the Polar regions. Using recycled plastic bottles, that they had collected from home, Year 4 are aiming to create penguins using a combination of tissue paper, glue and towards the end paints. By layering the tissue paper over the bottle and using colours to accent, Year 4 plan to make a display of the different types of penguin found in the Antarctic. 15.1.2019 We became part of the 'A' Team with 'A' life! This week, our school was visited by the awe-inspiring Mr A who came to teach us all about making healthy choices and what we can do to keep ourselves fit and healthy. We had a session in the morning where we learned through a HUGE variety of activities about healthy food options, balancing our diets, the importance of dental care, avoiding unhealthy habits and looking after our minds as well as our bodies. DID YOU KNOW...that the average 8-9 year old needs between 8-10 hours of sleep a night in order to maintain strong brain function and a healthy body?! Sadly, Miss Matthews said class time was not the place to catch up on missed sleep. Invigorated by this new knowledge, we returned in the afternoon ready for our circuit training session. We, again, took part in huge range of activities that got our hearts racing and loving life! 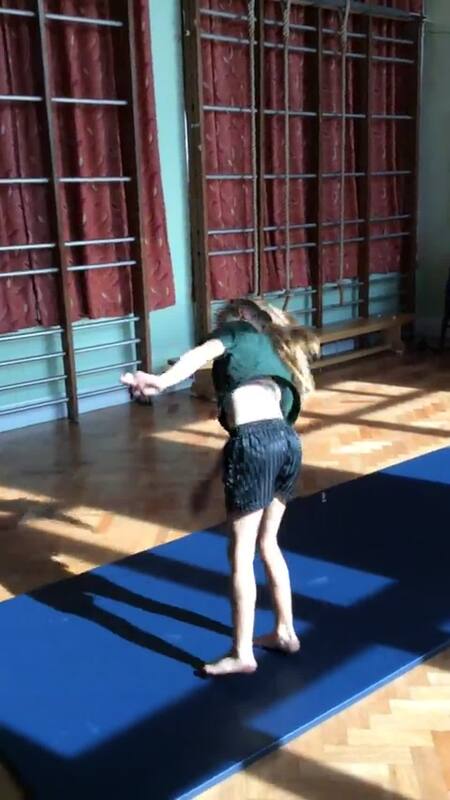 Mr A told us that just 10 minutes of dancing at home after school can drastically improve our heart's healthiness and our emotional resilience, and over time it can make a colossal impact on improving our fitness too! This week in Year 4, we've not only been working hard on our final pieces of curriculum learning but also getting into the festive spirit! On Friday the 7th of December, we will be holding our annual school fair. St Margaret's class decided to make Christmas tree decorations, we've created a snow-person design and a Christmas tree. We cut and glued felt together and attached a loop of ribbon to hang the ornament with. We then went crazy with the glitter glue and made some beautiful designs. 30.11.18 Science Comes to Year 4! This term, we've been learning a lot about sound. We've been studying how it's created, where sound comes from and how it moves. Here are some pictures of our experiment. We were testing how sound strength changes over distances, we did this by making string cups with different lengths of string. It was really funny and a great way to test out the science behind sound travel. The shorter the string the clearer the sound, but the longer the string the weaker the sound. St Margaret's take on Bollywood!!! Today our school was visited by the wonderful Kalpesh, A.K.A. Mr Bollywood, we had an amazing time learning some exuberant moves before performing for our adults at the end of the day. Some of our adults got to have a dance too! It was yet another fab way to share cultures and faiths in our school. We can't wait to invite Mr Bollywood back! Challenge 21: 21 Exercises in 21 minutes! 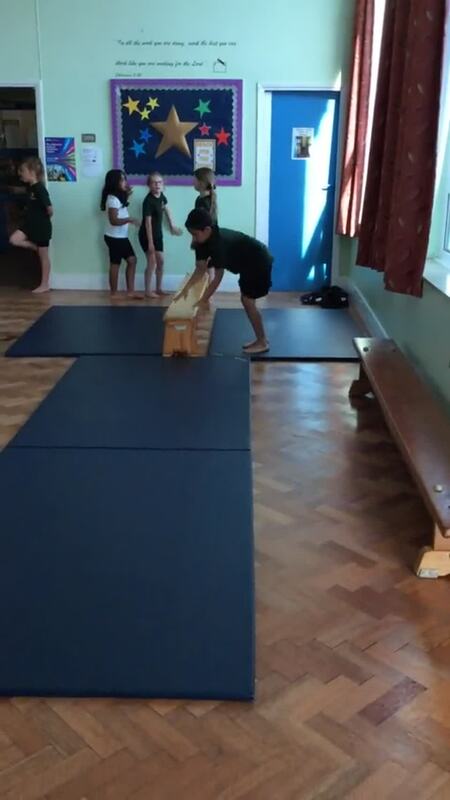 Therefore, Year 4 set themselves the challenge of carrying out a sponsored workout where they would carry out 21 different exercise in 21 minutes without any rest breaks! Rising to the occasion with superb enthusiasm, Year 4 smashed the challenge and are now collecting their well-earned sponsorship money. Congrats year 4! Our new Maths topic is addition and subtraction. We've been examining exchanges , we've looked at the deeper meaning behind the numbers and what causes exchanges to take place. We've used place counters to help organise and structure our thinking which later allowed us to feel confident when tackling reasoning problems. To our NEW year 4s! The Important Bits and Bobs! Spellings: The list of expected year 4 spellings can be found HERE. We will be practicing these in class and in our homework throughout the school year. PE: On Mondays, we will be swimming. You will need: a swimming costume or trunks (rash vests and surf vests are acceptable if suitable for water), a towel, a plastic bag (to keep your things dry!) and goggles/swim hats are optional. Swim hats are advisable for long hair to prevent cold heads post-swim. On Fridays, children will have a school PE lesson. They will need: a green t-shirt, black shorts and either plimsolls or trainers. SNACKS: Children are allowed a healthy FRUIT snack at break time. We don't allow jellies, fruit flavoured items or cereal bars. Children should ONLY be drinking WATER at school. Daily Mile: As a way to encourage all pupils, and staff to maintain a healthy, balanced life style, we will be partaking in the daily mile on days where children are not taking part in a PE or swimming lesson. Children may wear plimsolls or trainers for this activity. Reading: Children have been equipped with yellow diaries and books. These need to be in school EVERYDAY so that adults can use all available time to read with children. Children should be reading REGULARLY at home, we say to aim for a minimum of 5 minutes for 5 nights a week. Homework: Homework will go out on Thursdays and is expected back promptly on Tuesdays. If you have difficulties in completing the homework come see Miss Matthews ASAP on the Friday or Monday for help. Homework directions can be found inside both of your books if you require further information. The Autumn copy of our Topic booklet can be viewed here. Our topic booklet for the Summer Term can be found here! PE: Our new PE days for the Summer Term are Tuesdays and Fridays. The children will need to have their school PE kit (green t-shirt, black shorts/sports trousers, trainers/plimsoll) in school on these days. Our new topic for this term is the exciting Ancient Egyptians! We will be exploring ancient Egyptian life, looking everything from food and culture to religion and sport. 27.4.18 Our first Ukulele Lesson! Today, we were introduced to the enigmatic Mr Walker! He is going to be our Ukulele teacher for the next few weeks, we've never played it before. We were nervous but excited. 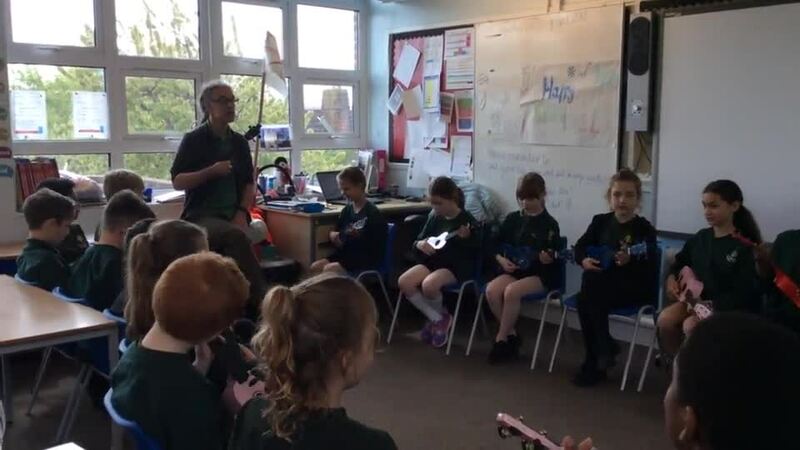 Luckily, Mrs Brownbill (our music teacher) had a box of Ukuleles for us to use. To celebrate St Joseph's Day we created portraits of St Joseph by drawing an outline, then scrunching tissue paper into balls and sticking them on. We aimed to include a white lily on each portrait as this was a very important symbol for St Joseph. Welcome back after your Winter break! We've got lots to do this term. Our Spring topic booklet link is here. September '17 Welcome back Year 4! We have lots to do and learn this year so let's get started. Follow this link to our Autumn Term learning booklet. Remember to put names and labels on your school uniform, lunch boxes, book bags, water bottles and PE kits. That way if it gets mixed up, the item can be returned to the rightful owner quickly. Being part of a healthy school means that we need to eat and drink the right things as well as exercise. 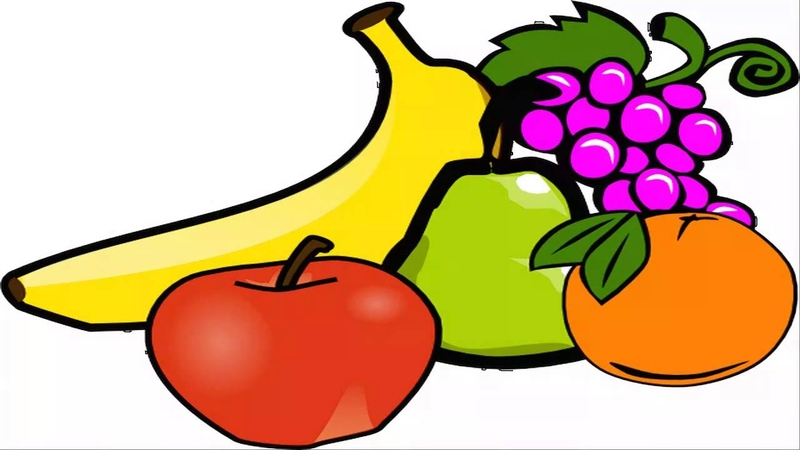 Although fruit is not provided for KS2 children, children can bring a fruit or vegetable snack (jelly pots and sugary items do not count) to be consumed at break time in the morning. We also ask that water is the only drink brought into school please. Homework will be handed out every Thursday and expected back the following Tuesday. Homework that is late or incomplete will result in a loss of play time and a loss of 15 minutes Golden Time. If there is a difficutly in completing the homework children are encouraged to notify their teacher on the Friday and Monday before it is due, a homework club is also available on a Friday during Golden Time in KS2. Homework will be 2 pieces of literacy work (spelling practice and a writing task) and a numeracy piece. Both should be completed in the book unless directed otherwise and should be completed in pencil or black/blue pen. Felt tips, coloured pencils and crayons are NOT ACCEPTABLE. At this stage every child should be reading for at least 5 minutes every evening with either an adult or trusted older sibling. 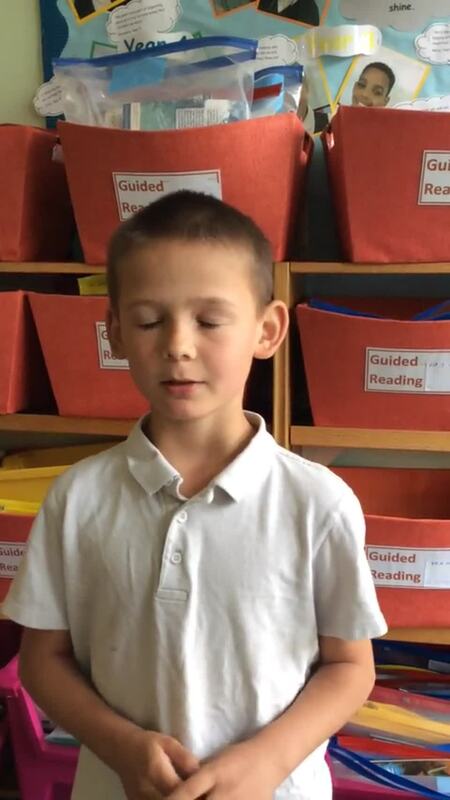 This reading session should be recorded in their yellow reading diary and brought to school every day. In the Spring term Year 4's PE sessions will be on Mondays and Tuesdays. Your child will need: a bag for their kit, green t-shirt, black shorts and either plimsolls or trainers. This can be adjusted for when the weather is colder with an additional jumper or black sports trousers being acceptable. Swimming has finished for Year 4 now! Congratulations to all for making such great progress! 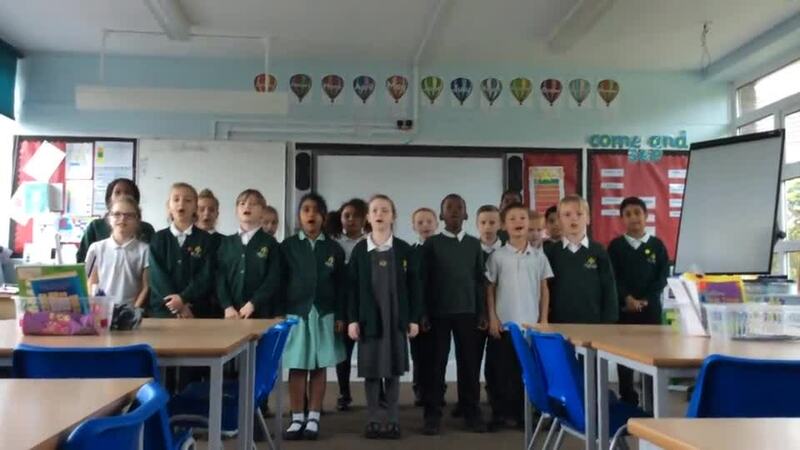 On Tuesday the 3rd of October Year 4 performed their song 'Like A Roman' to the Grandparents, Parents and school. They were nervous but they didn't let that stop them. After this, the Grandparents and Parents who attended were invited back to the classroom to spend some time with the children. We solved numerous maths problems, worked in teams and partnerships and enjoyed some reading time too. Thank you to all who attended, it meant a great deal to our class. In case you missed it, you can see a performance of our song, 'Like A Roman', in the video below. Enjoy! Some of our gymnastics skills at work! Please click on the images to find out more information about your child's topic.